Those of us who have studied under Yisrayl Hawkins for a number of years will recall his longing to write a commentary on the Holy Scriptures. 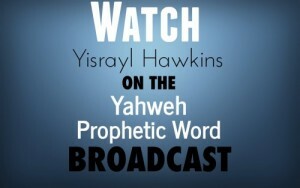 Since he was seventeen, Pastor has dreamed of producing this commentary and today, with the advance of technology as prophesied by Daniyl, The House of Yahweh will soon have available the “Yisrayl Hawkins Says” Program. Recognizing the significance of this announcement, the congregation rejoiced and gave Yahweh the Glory! “Let No Man Deceive You” was the title of Future Priest Nabayah’s sermonette today. He read Genesis 3:1-5 and explained that Satan deceived Eve into breaking Yahweh’s Law. Young Nabayah answers two questions. He also helps us to recognize that Yahshua kept the Laws and did not come to “destroy” them or “do away” with them as is taught by deceivers. If the scriptural evidence were not enough, Future Priest Nabayah tells us to be mindful of the difficulties that trouble the world – disease, violence, wars, drought, hunger, and unnatural weather events. Mankind needs the Laws of Yahweh to solve their problems. Next, we heard from Future Priest Deacon Yisrayl Abel and his topic, “Protection.” He read Psalm 91, explaining that the only place one can find protection is The House of Yahweh. We show our love for Yahweh when we 1) call upon Him by His Name and 2) keep His Laws. The deacon goes over a sermon by Yisrayl Hawkins on 4/19/2006 in which Pastor states that the pestilence the Psalmist described is the same as Yahshua’s depiction of what the End Times would be like. The bottom line is that only when we keep Yahweh’s Laws will we receive Yahweh’s protection – the protection mentioned in Psalm 91. Yisrayl is the Spokesman of the Two Witnesses, and those who call upon the Name of Yahweh through the teachings of Yisrayl will be delivered as the Prophet Yahyl prophesied. The news today, presented by the Great Kohan Yliyah, was lengthy and crammed with events that mark the times we live in. Throughout we note the system behind all the problems. Yisrayl Hawkins told us that in today’s news we see the face of the gods. He cautions that it may look desirable to many today, as it did to Adam and Eve, but in the end, it only brings misery and destruction. Pastor spoke about the physical body that Yahweh created for us and the warning He gave that it is the keeping of His Laws – strictly – that would guarantee our health. Sadly, we see a world that has gone the way of breaking Yahweh’s Laws and the diseases have accompanied mankind from generation to generation. We have all inherited the sins of those before us and if we do not turn from sin today, we only compound the problems within our own bodies and house the potential to spread it to others. Depleted uranium is also part of the problems today. We recall the amounts used in Iraq and know that wind currents have transported particles throughout the earth. However, the protection of Yahweh has veered winds currents away from Abel. Pastor spoke in detail about the soil and micro-kingdoms that Yahweh created to provide a balance to assist all life. The things that mankind has wreaked upon the earth has defiled our very life soil and in places, science admits it may take 17,000 years to remove it. Therefore, Isayah’s prophecy that the earth mourns rings true today. In speaking of Yahweh’s Laws, Yisrayl tells us that Yahweh gave us precise detail on how to dispose of bodily waste – it most certainly was not rivers and streams. Using the soil, according to Yahweh’s Law, has a dual purpose, 1) safely disposes waste, and 2) provides necessary elements of communication to existing soil life in order to serve mankind.